603 pages | 47 B/W Illus. Cryptography is ubiquitous and plays a key role in ensuring data secrecy and integrity as well as in securing computer systems more broadly. Introduction to Modern Cryptography provides a rigorous yet accessible treatment of this fascinating subject. The authors introduce the core principles of modern cryptography, with an emphasis on formal definitions, clear assumptions, and rigorous proofs of security. The book begins by focusing on private-key cryptography, including an extensive treatment of private-key encryption, message authentication codes, and hash functions. The authors also present design principles for widely used stream ciphers and block ciphers including RC4, DES, and AES, plus provide provable constructions of stream ciphers and block ciphers from lower-level primitives. The second half of the book covers public-key cryptography, beginning with a self-contained introduction to the number theory needed to understand the RSA, Diffie-Hellman, and El Gamal cryptosystems (and others), followed by a thorough treatment of several standardized public-key encryption and digital signature schemes. Containing updated exercises and worked examples, Introduction to Modern Cryptography, Second Edition can serve as a textbook for undergraduate- or graduate-level courses in cryptography, a valuable reference for researchers and practitioners, or a general introduction suitable for self-study. "The work is comprehensive, rigorous, and yet accessible for dedicated students." "… this book fills a significant gap among previous cryptography textbooks by explicitly discussing the philosophy behind this approach, gradually building up the relevant theory and giving a broad overview of the discipline conceived within this framework. The result is a coherent picture of the field that provides a pleasing clarity in its explanation of this perspective through a systematic, step-by-step development of important concepts. … The material from the first edition has been restructured and expanded, with an emphasis on practical aspects that provides a nice counterpoint to the theory and helps to highlight its real-world relevance. … This textbook is appropriate for use in teaching at either an advanced undergraduate or graduate level … a particularly valuable resource for graduate students with a computer science or mathematics background who are seeking a pathway to understanding the current cryptography research literature. In the preface, the authors mention their aim of treating modern cryptography through a unified approach that is rigorous yet accessible—Introduction to Modern Cryptography achieves this admirably." "This book is a comprehensive, rigorous introduction to what the authors name ‘modern’ cryptography. … a novel approach to how cryptography is taught, replacing the older, construction-based approach. … The concepts are clearly stated, both in an intuitive fashion and formally. … I would heartily recommend this book to anyone who is interested in cryptography. … The exercises are challenging and interesting, and can benefit readers of all academic levels." "Over the past 30 years, cryptography has been transformed from a mysterious art into a mathematically rigorous science. 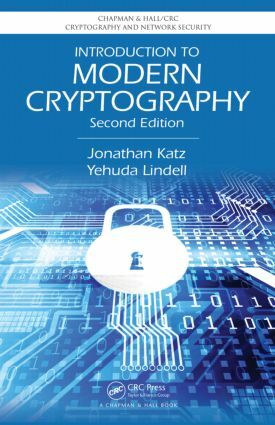 The textbook by Jonathan Katz and Yehuda Lindell finally makes this modern approach to cryptography accessible to a broad audience. Readers of this text will learn how to think precisely about the security of protocols against arbitrary attacks, a skill that will remain relevant and useful regardless of how technology and cryptography standards change. The book uses just enough formalism to maintain precision and rigor without obscuring the development of ideas. It manages to convey both the theory's conceptual beauty and its relevance to practice. I plan to use it every time I teach an undergraduate course in cryptography." "The greatest attribute is the fact that the material is presented in such a unified way. This is not just a collection of topics from cryptography thrown together at random. One topic leads effortlessly to the next. As such, this is a virtually indispensable resource for modern cryptography." "… an excellent introduction to the theoretical background of cryptography. It would be a fine textbook for an advanced undergraduate (or graduate) course in theoretical computer science for students who have already seen the rudiments of cryptography. It will be a valuable reference for researchers in the field." "The book is highly recommended as a textbook in cryptography courses at graduate or advanced undergraduate levels. … covers, in a splendid way, the main notions of current cryptography from the point of view of information-theoretical security. This corresponds indeed to a modern cryptography approach." Is the Random-Oracle Methodology Sound? Jonathan Katz is a professor of computer science at the University of Maryland, and director of the Maryland Cybersecurity Center. He has published over 100 articles on cryptography, and serves as an editor of the Journal of Cryptology, the premier journal of the field. Prof. Katz has been invited to give introductory lectures on cryptography for audiences in academia, industry, and government, as well as an on-line cryptography course through Coursera. Yehuda Lindell is a professor of computer science at Bar-Ilan University. He has published more than 90 articles on cryptography and four books, and has considerable industry experience in deploying cryptographic schemes. Professor Lindell lectures widely in both academic and industry venues on both theoretical and applied cryptography, and has been recognized with two prestigious grants from the European Research Council.